Will EU re-open the Brexit negotiation? 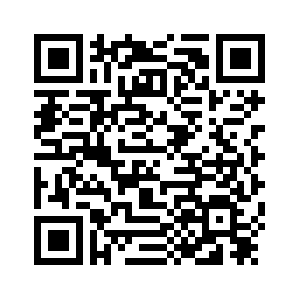 Editor's note: Liu Jin is an assistant research fellow of China Institute of International Studies. 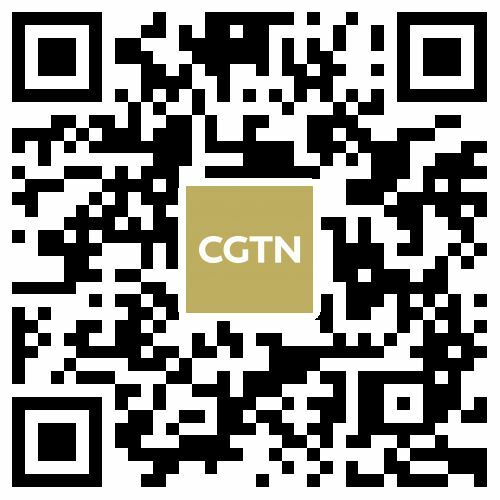 The article reflects the author's views, and not necessarily those of CGTN. After a historic defeat in the Parliament just two weeks ago, Theresa May's tactic to win over Democratic Unionist Party (DUP) and thus Conservative rebels works, for the time being. The Northern Ireland backstop in the Withdrawal Agreement, which was reached by the UK government and the EU last November and seeks to avoid a hard border between the Republic of Ireland and Northern Ireland in any condition, proved to be the poison that split the Conservative and denied DUP's support, ensured the government's defeat above mentioned. 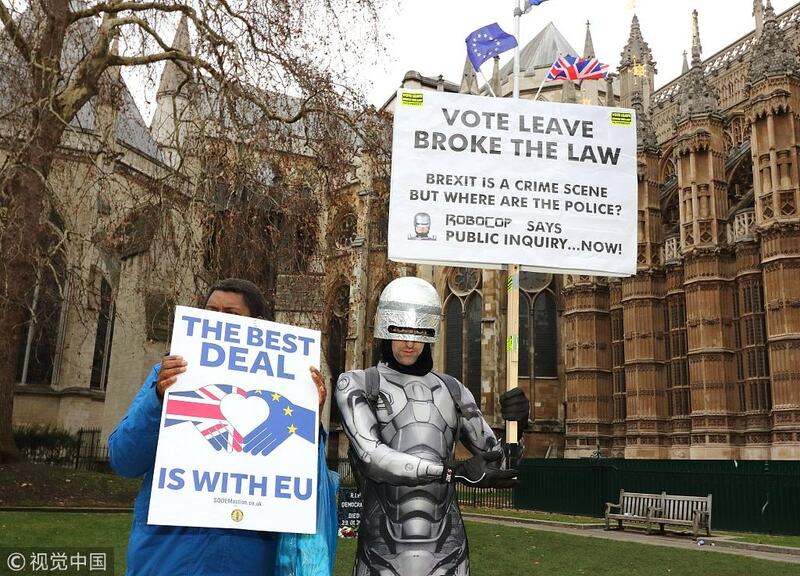 A protester is seen in a superhuman costume holding a placard during a demonstration by Pro-Brexit and Pro-EU protesters outside the Houses of Parliament on the day that MPs voted on the amendments on the Brexit deal in the House of Commons. /VCG Photo. After May promised to renegotiate with the EU on the backstop and seek to secure “a legally binding change”, DUP, the small pro-UK Northern Ireland party which props up May's minority government in the Parliament by its 10 votes, united with the Conservatives, thus ensured the pass of the Brady Amendment (317 vs. 301), which proposed by senior Tory backbencher Sir Graham Brady and backed by the government, requires the backstop to be replaced with “alternative arrangements to avoid a hard border” but otherwise supports the government's deal. British MPs, previously accused of EU leaders by “keep saying what they don't want but never what they want”, now explicitly expressed their demands, although by 16 votes, that the backstop is the Main Problem and UK's Parliament will pass the deal with it solved in some form, thus avoiding the no-deal scenario. The pass of the Brady Amendment gives May “enormous firepower” to renegotiate with the EU. What's more, after the Parliament passed another amendment in Tuesday's voting (318 vs. 310), which was put forward by a Conservative MP and a Labour MP and “rejects the United Kingdom leaving the European Union without a Withdrawal Agreement and a Framework for the Future Relationship”, Labour's leader Jeremy Corbyn, who refused to meet the PM in trans-party talks previously, now agreed to “discuss next steps” with May since MPs have rejected no-deal Brexit, although no binding. 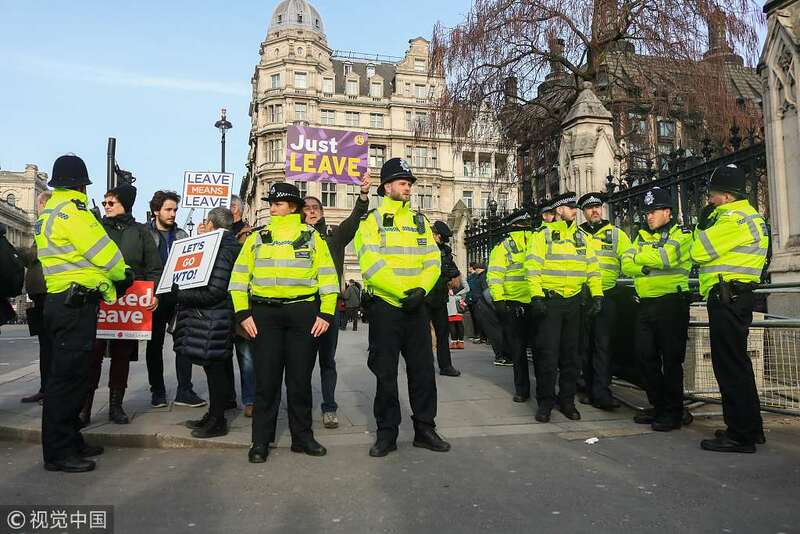 Pro Leave supporters demonstrate outside Parliament on the day Prime Minister Theresa May faces several amendments to her Brexit deal by members of Parliament seeking to delay Article 50 without a deal and Britain leaving the European Union on March 29, 2019. /VCG Photo. Besides, MPs' rejection of the other five amendments indicated that they reject a permanent custom union with Brussels and a version of EU single market and they won't delay the Brexit. The prospect of UK government to win more support from its MPs and forge a more solid bargaining position seems brighter than ever. The question now is, facing UK Parliament's explicit demands by passing and not passing amendments, will EU re-open the Brexit negotiation? According to the BBC, the immediate answer to this question seems negative as Donald Tusk, President of the European Council, stood to EU's position and said after the result that the Withdrawal Agreement was “not open for re-negotiation” and “remains the best and only way to ensure an orderly withdrawal of the United Kingdom from the European Union”. The Irish government also stand to this no re-negotiation position. 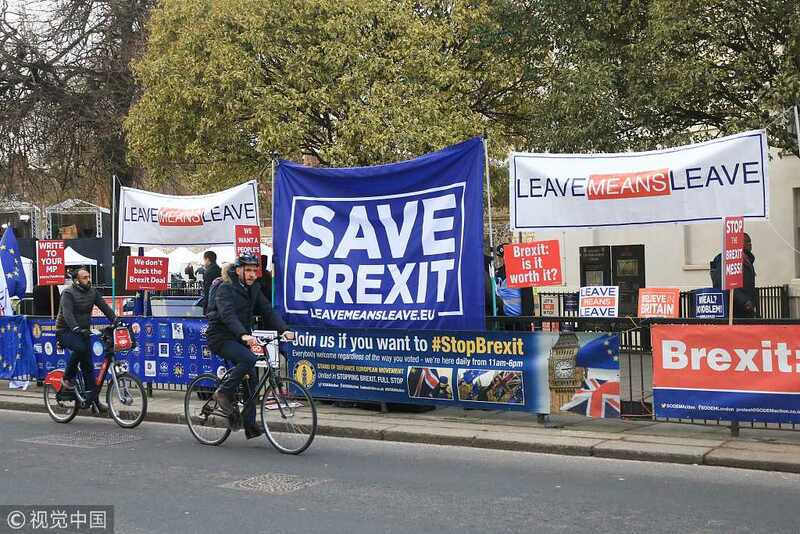 Banners from Pro Leave camp and European flags hang on railings outside Parliament on the day Members of Parliament debate several key Brexit amendments to extend Article 50 and delay Brexit in case of a No Deal. /VCG Photo. Nonetheless, there is still a chance that the EU may compromise in some form to ensure an orderly Brexit. Beside refuse to re-open the negotiation, Tusk also indicated again that EU will consider “reasoned request” for an extension of Article 50, i.e., delay the Brexit. Although this option is rejected by MPs in the voting, for the time being, re-negotiation does need more time, which would very likely need to delay the Brexit. Besides, according to a BBC's report, the Brady Amendment may pave the way for a so-called “Malthouse compromise,” which was worked out by trans-party MPs, calling for extending the transition period for a year and protecting EU citizens' rights. This plan has gained support from both Remainers and Leavers, and are likely to be accepted by the EU since it steers clear of the backstop impasse temporarily and gives both sides more time to work it out. Finally, given EU's past negotiation tactics and records, observers could not rule out the possibility that the EU may compromise on the backstop in some acceptable way to both sides at the last minute. To punish the UK, whose decision to exit almost brought an existential crisis to the EU, and suppress internal division, the EU kept extreme pressure on the UK government and MPs in the long Brexit negotiations, always and only reach agreements at the last minute. 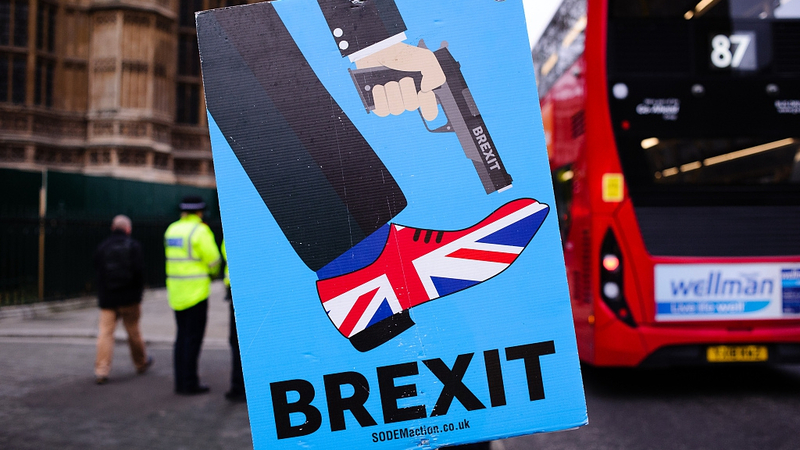 The deal reached by the UK government and the EU caused deep concerns and strong dissatisfaction among UK MPs since it mirrored EU's powerful position unduly. Nonetheless, we must keep in mind that although the UK will suffer more in no deal, the EU will suffer a lot as well. The delay of the vote and the historic defeat of the deal in the Parliament undoubtedly shifted part of the pressure to ensure an orderly Brexit to the EU. In fact, Germany's foreign minister has already talked about the possibility of re-negotiation on January 17.